Developers and makers are invited to discover the flexibility of a low-power programmable gate array. The Intel® Cyclone® 10 LP Evaluation Kit provides an easy-to-use platform for evaluating Intel® Cyclone® 10 LP FPGA technology and Intel Enpirion® regulators. 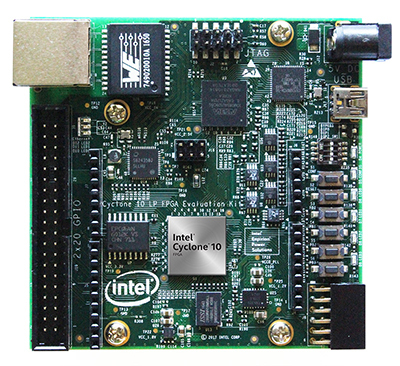 Whether you are an FPGA developer, software developer, maker, seasoned IoT developer, coding newbie, or just curious about FPGAs, we hope your experience with the Intel Cyclone® 10 LP FPGA kit is both informative and fun.